No, I’m not dead. I just have a child who doesn’t want to nap or play by himself, and therefore little time to cook and even less to write about it. I haven’t even had time to make desserts, which, considering my sweet tooth, is a shocking turn of events. I had all the ingredients for my Daring Bakers challenge too, but the deadline flew by before I had a chance to make it, a huge disappointment for me because I was really excited to try making homemade pizza for the first time. I’ll still have to undertake it on my own one day soon. I think for the time being I’ll try to keep posts short and sweet. I’ve had a bunch of photos waiting for exposition for what seems like months, so I’m just hoping I can recognize them. 🙂 Here was a good one from the end of September (really? 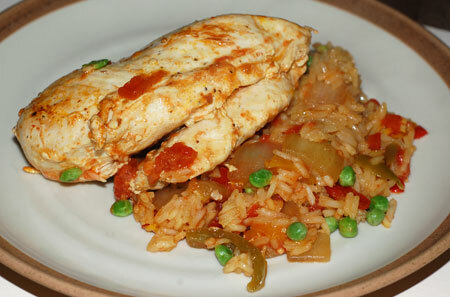 ): arroz con pollo. The recipe, for which I subbed available boneless breasts at a slightly later point in the cooking process, made a huge amount of food and was pretty tasty. Probably not the best, and certainly not the most authentic recipe, so I’ll keep poking around, but the leftovers kept us fed for a week in various iterations. After we tired of eating it plain, I made homemade flour tortillas for the first time. Reheated the rice and topped it with some scrambled eggs and cheese and called it a breakfast burrito. 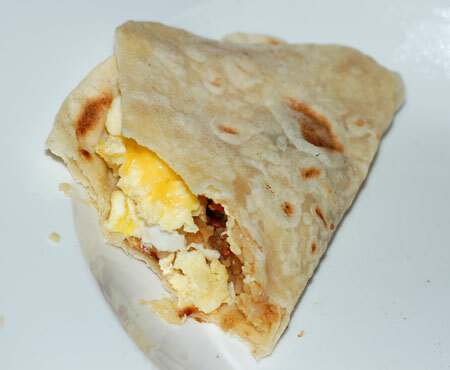 The tortillas were so wonderful and easy to make, that I’ve refused to buy tortillas ever since, even though Nolan thinks it takes me too long to roll out and griddle the dough. Guess I just need more practice! Cut shortening into flour. Dissolve salt in warm water, then add gradually to flour mixture. Mix until dough begins to form. Turn onto floured surface and knead about 3 minutes. Divide into 8 balls, and cover with plastic wrap to rest at least 30 minutes. Heat a large cast iron pan over medium/medium-high heat. Preheat oven on low (~200 degrees). On floured surface, roll out ball until about 8 inches in diameter, or as thin as possible. Grill in dry pan, about 30 seconds on each side. Hold the tortillas in the oven under a towel while you finish cooking the rest, so they don’t stiffen up. 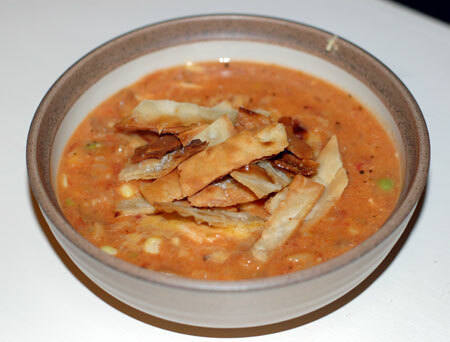 We had three tortillas and a ton of arroz con pollo still leftover after the breakfast burritos, so the next night I improvised a sort of tortilla soup that came out really well. Fortunately, I jotted down some notes for it, because otherwise now I would have no clue what I did. I didn’t measure, but you can adjust it to your own tastes. Saute the onion and garlic with olive oil in a large pot until onion is translucent. Season to taste with dried oregano, chipotle powder, and alder smoked salt. Add tomatoes, chicken broth, and half a cup of leftover rice; bring to a simmer and then puree until fairly smooth with a stick blender. Next add the shredded chicken, corn, and about a cup more rice; heat through and stir in sour cream at the end. Serve topped with a pile of tortillas and some cheddar cheese.